This place is a whole world of fun. It’s a bar, it’s a restaurant, there’s great food and cool jazz tunes. And while the vibe certainly isn’t as serious as some of the places I’ve been to recently, you can still count on some seriously good food thanks to Dan Pepperell from Top 100 establishment 10 William street. After walking past the tiny bottle collection, you’ll find yourself in a huge downstairs area with two bars and a large restaurant area with dim lighting (yes, more crappy photos, sorry). We were lucky enough to score a table. There were 5 of us this night and we were in the mood to share a few things. It’s a French bistro menu laden with the ol’ classics and we shared the beef tartare, tomato tart, pickled octopus and the Oeufs en Gelee, but not only were we lucky to get a table that night, we were also extremely lucky to score the last of the duck special for the night… Roast duck stuffed with duck sausage served with pickled cherries and Dijon jus. That duck had our name on it. As soon as the waitress told us there was only one duck left we made sure we snaffled it before anyone else could. All 900g of meat on the plate! I am so thankful. 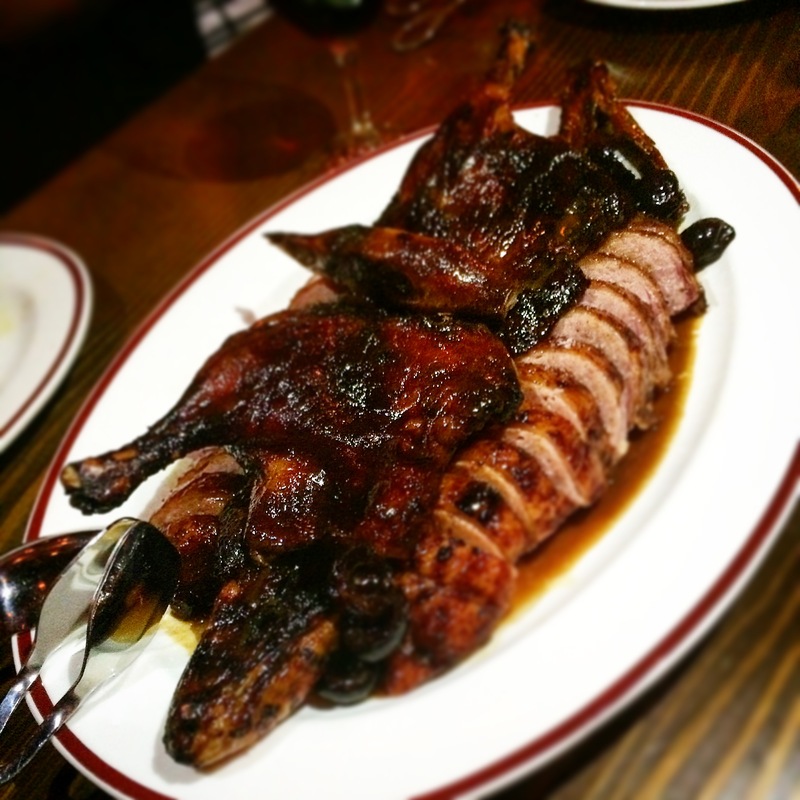 This was duck on steroids – duck taken to a whole new level – possibly the best duck I’ve ever had. Succulent, meaty and delicious. If you go, you really should ring them beforehand and demand this duck! And what made our night even better was we were looked after by none other than the infamous Dennis Roman (aka the man with the mo’) who’s worked at numerous Sydney venues over the years including the Ivy and Café Paci. He pops up everywhere and he recommended some great wines for us. He even gave us a tour later on, showing us the attached theatre. The man with the moustache… Dennis Roman!